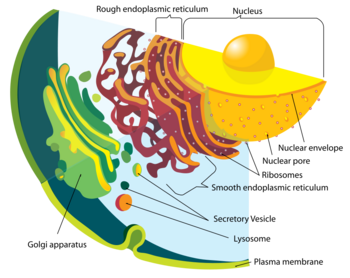 Diagram of a typical animal cell (eukaryote). Organelles:(1) nucleolus (2) nucleus (3) ribosome (4) vesicle (5) rough endoplasmic reticulum (ER) (6) golgi apparatus (7) cytoskeleton (8) smooth ER (9) mitochondria (10) vacuole (11) cytoplasm (12) lysosome (13) centrioles. Cells have many of their functions compartmentalized into discrete structures called organelles. Much like the human body contains many different organs, such as the heart, lung, and kidney, with each organ performing a different function. Cells also have a set of "little organs", called organelles, that are adapted and/or specialized for carrying out one or more vital functions. Organelles are found only in eukaryotes and are always surrounded by a protective membrane. Prokaryotes are distinct from eukaryotes in having no nucleus or other organelles that are enveloped in a membrane. The only organelle possessed by both prokaryotes and eukaryotes is the ribosome. Nucleus - holds genomic DNA in eukaryotes. 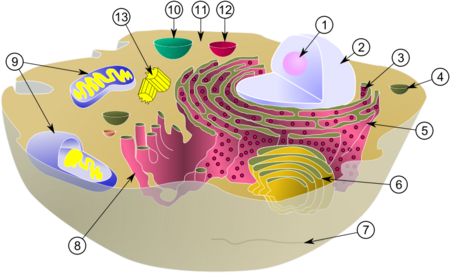 The nucleus is the most conspicuous organelle found in a eukaryotic cell. It houses the cell's chromosomes and is the place where almost all DNA replication and RNA synthesis occur. The nucleus is spheroid in shape and separated from the cytoplasm by a membrane called the nuclear envelope. The nuclear envelope isolates and protects a cell's DNA from various molecules that could accidentally damage its structure or interfere with its processing. During processing, DNA is transcribed, or synthesized, into a special RNA, called mRNA. This mRNA is then transported out of the nucleus, where it is translated into a specific protein molecule. In prokaryotes, DNA processing takes place in the cytoplasm. Mitochondria - performs cellular respiration in eukaryotes. Mitochondria are self-replicating organelles that occur in various numbers, shapes, and sizes in the cytoplasm of all eukaryotic cells. Mitochondria contain their own DNA that is separate and distinct from the nuclear genome of a cell. Mitochondria have two functionally distinct membrane systems separated by a space: the outer membrane, which surrounds the whole organelle; and the inner membrane, which is thrown into folds or shelves that project inward. These inward folds are called cristae. The number and shape of cristae in mitochondria differ, depending on the tissue and organism in which they are found, and serve to increase the surface area of the membrane. Chloroplast - convert light energy from the sun into ATP through a process called photosynthesis. Like mitochondria, they are surrounded by a double membrane with an intermembrane space. They also have their own DNA and are involved in energy metabolism; and both also have reticulations, or many foldings, filling their inner spaces. Ribosome - translates mRNA into polypeptides in both prokaryotes and eukaryotes. The ribosome is a large complex composed of many molecules, including RNAs and proteins, and is responsible for processing the genetic instructions carried by an mRNA. The process of converting an mRNA's genetic code into the exact sequence of amino acids that make up a protein is called translation. Protein synthesis is extremely important to all cells, and therefore a large number of ribosomes—sometimes hundreds or even thousands—can be found throughout a cell. Ribosomes float freely in the cytoplasm or sometimes bind to another organelle called the endoplasmic reticulum. Ribosomes are composed of one large and one small subunit, each having a different function during protein synthesis. Endomembrane system: Endoplasmic reticulum, golgi apparatus, etc. Endoplasmic reticulum - a transport network for molecules targeted for certain modifications and specific destinations, as compared to molecules that will float freely in the cytoplasm. The ER has two forms: the rough ER and the smooth ER. The rough ER is labeled as such because it has ribosomes adhering to its outer surface, whereas the smooth ER does not. Translation of the mRNA for those proteins that will either stay in the ER or be exported (moved out of the cell) occurs at the ribosomes attached to the rough ER. The smooth ER serves as the recipient for those proteins synthesized in the rough ER. Golgi apparatus - processes and packages various macromolecules into vesicles. Proteins to be exported are passed to the Golgi apparatus, sometimes called a Golgi body or Golgi complex, for further processing, packaging, and transport to a variety of other cellular locations. Lysosome - performs cellular digestion. Lysosomes and peroxisomes are often referred to as the garbage disposal system of a cell. Both organelles are somewhat spherical, bound by a single membrane, and rich in digestive enzymes, naturally occurring proteins that speed up biochemical processes. For example, lysosomes can contain more than three dozen enzymes for degrading proteins, nucleic acids, and certain sugars called polysaccharides. All of these enzymes work best at a low pH, reducing the risk that these enzymes will digest their own cell should they somehow escape from the lysosome. Here we can see the importance behind compartmentalization of the eukaryotic cell. The cell could not house such destructive enzymes if they were not contained in a membrane-bound system. This page was last modified on 9 March 2014, at 20:23.